Bayer Leverkusen v Benfica was (together with Tottenham v Lyon) probably the most attractive fixture of this round of the Europa League. Two very good teams, with very different approaches and formations were expected to battle it out for a place in the next round. If ever there was the need for evidence that the Europa League does not command the same amount of respect and interest from clubs (and therefore fans), last night's match offered proof enough. Both coaches chose to rotate their squads, seemingly more worried about next weekend's matches in their own leagues (Bayer, for instance, will be playing against a team that lies second from last). Benfica coach Jorge Jesus rested Máxi Pereira, Enzo Pérez, Lima and Sálvio. Sasha Lewandowksi and Sami Hyppia followed a similar path and made several changes in defence and midfield, the attack remaining intact. When both teams got on the pitch, there remained no doubts: Bayer Leverkusen would deploy a 4x3x3, a system that often creates problems for Jesus' charges. There was some talk ahead of the match that Benfica and Bayer Leverkusen might switch roles as home and away teams - Benfica pressing intensely and Bayer Leverkusen playing on the break -, but the exact opposite happened. Despite fielding an eleven jam packed with attack-minded players, Jesus' strategy was much more cautious, with Ola John and Urreta mindful of their defensive duties. This, in turn, forced the German team to resort to a sort of game they are not comfortable with: taking initiative and having time on the ball. Nevertheless, it should be said they managed to adapt their strategy quite well for the first 25 minutes. 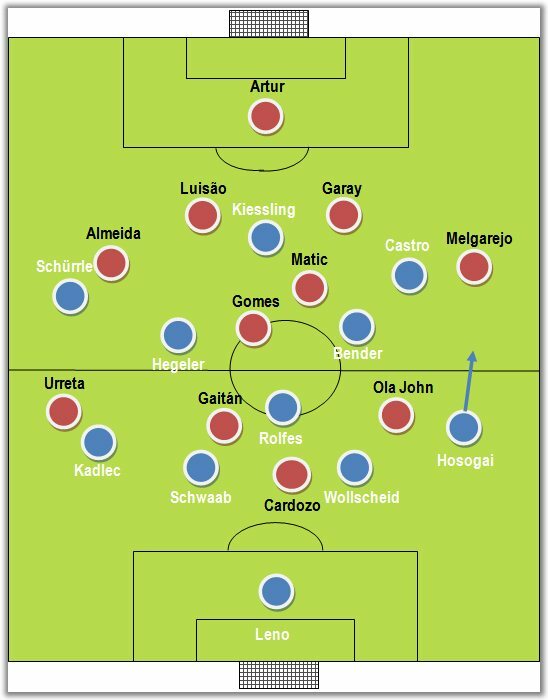 As so often is the case when playing against a 4x3x3, there was a void in the middle, since Gaitán - who was playing off Cardozo - did not drop back, meaning Bayer Leverkusen always had an extra man in midfield. In fact, both Matic and André Gomes felt the need to push up towards Bayer Leverkusen's midfielders to prevent them from having too much time on the ball, but that frequently left Benfica's back four against Bayer Leverkusen's extremely fluid three-pronged attack - Castro on the right, Schürrle on the left and Kiessling as the striker. During those first 25 minutes, the home team found numerous passing lanes right through the middle, with Kiessling checking to collect the ball and return it to either Schürrle or Bender, Bayer Leverkusen's most attack-minded midfielder. Thanks to Hosogai's forays down the right (with Castro drifting centrally and opening up the space), the Germans would often find find themselves in very good positions, only to be let down by their touch or decision. After the first period's initial half, Benfica gradually took over and started taking control of the match. Even though the Eagles were not exactly wreaking havoc in their attacking third, Bayer Leverkusen looked very fragile whenever they gave the ball away, usually too slow to get back into position, a typical trait of a team more used to playing on the counter-attack. In many case, the positioning of the centre-backs, in particular, left much to be desired. The second half brought no significant changes, apart from the odd decision from Bayer Leverusken's coaching duo to remove Schürrle in favour of Sidney Sam. The team immediately looked less dangerous - in fact, Sam never had the chance to leave his mark -, which played right into the hands of Benfica. The match was becoming more and more stagnant, particularly because Enzo Pérez came on for the injured André Gomes and Gaitán probably got an earful from Jorge Jesus in order to help out defensively. Benfica struggled a bit in set pieces and they were almost made to pay for it on 60 minutes, but the scramble ended up yielding nothing but a corner for Bayer Leverkusen, who insisted on committing many men forward on such occasions. After the aerial duel, the Eagles were very quick to break away and Cardozo had all the time (and skill) to fake a first shot and then calmly chip the ball over the goalkeeper. The goal seemed to awaken the German team, who by then were more willing to take chances in attack and were once again more fluid. Benfica tried to cool the tempo of the match, but were still vulnerable here and there to combination plays down the middle. The match would end with a last ditch interception near Benfica's goal line, a crucial moment for a more relaxed approach in a week's time. Bayer Leverkusen find themselves in a very awkward position. A draw with no goals would put them in the driver's seat, but now they will be forced to get exposed in a type of game that does not favour them. Besides, Benfica are always much stronger when they play in their own turf and it is hard to envision the round taking a wrong turn for the Portuguese vice-champions.